Pundits seem almost universally agreed that Mitt Romney needs to have a “Reagan moment” in his first debate with President Obama, now just two days away. The moment they have in mind is when Ronald Reagan said, in response to incumbent Jimmy Carter about misrepresentations of Reagan’s record and platform, “There you go again.” I remember that moment. It was timely and it was compelling. What matters in the immediate political climate—infused with media “coverage”—is that the stakes have been raised for Romney in the upcoming debate. He has to convince people that he can walk on water. Better yet if he can demonstrate his power to walk on water by doing it onstage. That’s all we ask. If he can manage that, then he might get our attention, we might think about voting for him, and a few of us might even actually vote for him. This is silly. But it’s reality. So I’ve been thinking about what Romney could say that would achieve the expected (or desired) effect. But is this the right concern? Let’s remember that Reagan spoke with apparent spontaneity in his remark. And it may well have been spontaneous. 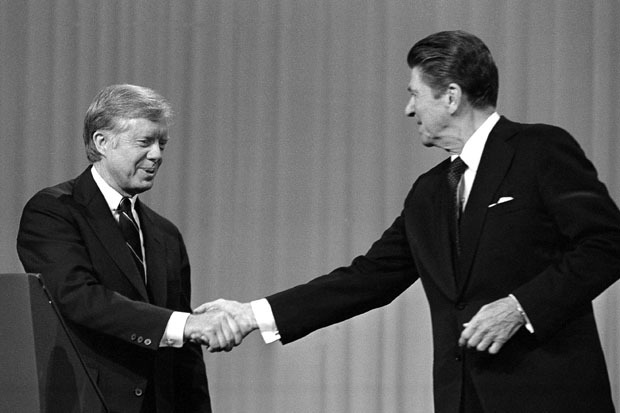 If so, Reagan had to have enjoined the debate with such a frame of mind that he could say, with such intensity and frankness, what he did when Carter kept up the spin. Maybe the lesson to be learned, then, is that Romney needs to have the right instincts, cultivated by months of campaigning and by his knowledge of current events and Obama’s response, as he walks onto the dais to go toe-to-toe with the President. One risk for any debater is a kind of “over-preparation.” In one sense, you can never over-prepare. But it is possible for a debater’s extensive preparation to hamstring his performance during a debate. One reason is that spontaneity may be compromised. And spontaneity, when well-timed delivery is good, is powerfully persuasive. Reagan said, “There you go again.” Romney doesn’t need a cute, canned sound bite that could be his undoing if it isn’t delivered properly. He needs to be relaxed and comfortable with himself, unintimidated by the President. If he rehearses what he believes deep down to be Obama’s greatest vulnerabilities, if he is in touch with his deepest convictions about the risks we face and what needs to be done about them, then he won’t be intimidated. Nothing is more effective than the courage of one’s convictions. Nevertheless, Romney could be effective if he finds a way to say, not “There you go again,” but “Here we go again,” in reference to the pile-up of unpalatable effects of Obama-style leadership. Romney should be able to recite what many perceive to be mistakes made during the past four years. The most recent event in the litany is the recent debacle in the Middle East, including the murder of an under-protected American Ambassador and the conflagration that threatens to worsen. “Here we go again. And we, the American people, can’t take much more of this.” This is what we should be thinking after this first debate, and Romney has a prime-time opportunity to make it happen. We should be wondering, “Does anybody really know what an Obama second term would be like?” The first term wasn’t like many who voted for him expected. Have they learned that they still have no idea what to expect? Is President Obama a Birther? I argued recently that questions about President Obama’s birthplace may plague him more in the next election season than it did during the 2008 election. Donald Trump, who is rumored as of today to have decided to run for the presidency, could press the issue so that Obama is compelled to respond. As president, it would be admirable for him to act in the interests of seeking national unity by providing what the birthers have asked for. It would also go far in deflating the steam that has built up among those who seriously believe that he was not born in the United States. Obama needs to find a venue for doing this that looks less like a capitulation to demands and more like the act of a statesman. That means offering the long form version of his birth certificate sooner rather than later. It would be a relief to many of us who are not birthers if Obama would take this simple step and put it behind us all. Let’s face it. This is the only way everyone will know for sure that Obama isn’t himself a birther. Question: What do you think about the birther controversy? Morris goes on to describe a scenario under which Obama is faced with a primary challenge from Democratic Congressman Dennis Kucinich of Ohio. The theory is that Kucinich can cut deeply into Obama’s left-wing base and seriously injure his chances of being re-elected in 2012. The Kucinich play will be to stress that President Obama made a grave mistake in going to war in Libya. Agreed. But what about the rest of us? With all that’s at stake, we have to hope that our President will not be making politically motivated decisions. Americans have been pleading with the President to explain his rationale for engaging our military in fighting action in Libya. Yesterday, March 28, President Obama gave the speech that was supposed to sell us on the decisions he’s been making, and to prepare us for decisions he’ll continue to make. Obama must be afflicted with misgivings, hearing as he no doubt has, that people from across the political spectrum are less than impressed with his leadership. To hear the President’s speech, and to hear it decoded, feel free to visit Thomas P. M. Barnett’s post for Esquire‘s “The Politics Blog.” Barnett revisits the President’s speech and offers a line-for-line translation of what Obama actually said. It would be hard to find a more plausible interpretation than Barnett’s. Barnett is a geopolitical strategist. He was educated at the University of Wisconsin (BA) and Harvard University (MA, PhD). He’s written four important books, including Great Powers: America and the World After Bush (2009). Is Donald Trump a “Birther”? Donald Trump has been making a very publicly visible appeal to President Obama to settle the matter once and for all and make his birth certificate public. Does this make Trump a “birther”? First, keep in mind that the term “birther” has been used by the media to stigmatize a portion of the American electorate as right-wing kooks. Some media outlets seem to have calculated that by calling these American citizens by this epithet it will eventually embarrass and silence them, or at least contain their influence. This appears to be a clear effort to defend the President. But defend him from what? Apparently, the President’s stubborn refusal to publish his birth certificate is viewed even by his defenders as a posture that is worthy of media defense. But why? And what exactly is a birther? You’re definitely supposed to be a birther if you actually believe that Obama was not born in the United States. There are people in this country who believe this. So they have the clearest claim to the epithet. And maybe some of these “true believers” wear the epithet with pride. Are you a birther if you are genuinely concerned about the possibility that Obama was not born in this country, and would simply like for him to step up and prove that he was? I wouldn’t say so. And this seems to be Donald Trump’s attitude. Trump, as far as I can tell, is not a birther. He has said that he hopes Obama was born in this country. Would a real birther hope for this? With Trump’s recent appeal to Obama to take the very simple step of proving his citizenship, I’ve thought about the issue a bit more than in the past. It now seems to me that Obama has repudiated an opportunity to demonstrate good will toward all Americans, including those who would like to have clarity about this matter. What possible harm can there be in accommodating a reasonable request for such information? What past American President would refuse to make his birth certificate public if there was such a broad interest in seeing his American citizenship demonstrated? 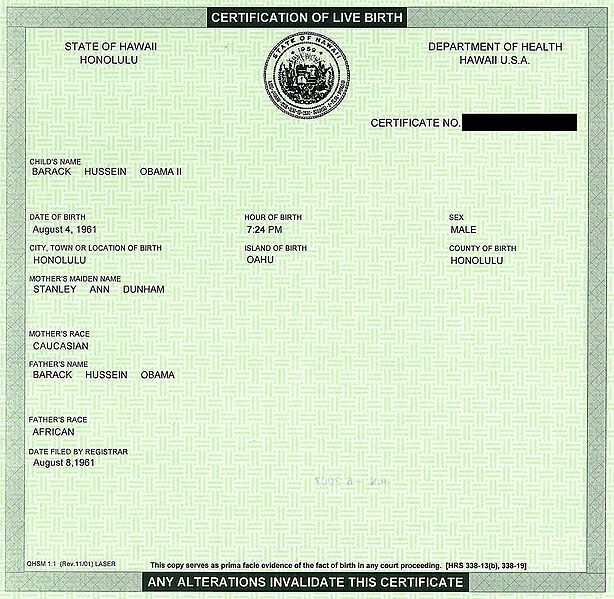 Many who are not generally considered birthers have enjoined Obama to produce his certificate. In response, challengers often say, “Do you believe that Obama was not born in the United States?” And if the answer is, “No,” then challengers think it’s stupid to ask the President for his birth certificate. But it isn’t stupid. If there is enough concern among the American people to see this demonstrated, then that should be reason enough for the President to accommodate them. That’s my view, then. Without believing that Obama was born outside the United States, I do believe he very simply ought to make his birth certificate public. I believe this because his refusal to do so has revealed a stubbornness that is unbecoming of the leader of our nation. There’s some reason why he does not wish to give satisfaction to those who have called for it. Those reasons create suspicion and escalate discord about the matter. Why not “bring the country together” on such a small point? Trump alleges that Obama has spent quite a bit of money to ensure that his birth certificate does not come to light. If that’s true, I’d like to know why. Does it lead me to believe that Obama was not born in the U.S.? No. Others have said that media outlets are so thorough in their scrutiny of a presidential candidate that if Obama was not born in the United States, then this would have been exposed during Obama’s candidacy. But doesn’t this argument cut the other way just as well? Doesn’t it stand to reason that if Obama was born in the United States—given the huge controversy concerning the President’s citizenship—compelling evidence that he was born in the U.S. would have come to light via media scrutiny? The evidence, apparently, hasn’t been conclusive either way. The issue hasn’t subsided and there’s reason to think it will haunt the President in the future. It’s looking now like Obama will be confronted with this issue again as he campaigns for a second term. Will the pressure be great enough this time round for him to capitulate and make his birth certificate public? Who can say? If the President was not born in the U.S., then, by Article 2 of the U.S. Constitution, Obama is not the legitimate President of the United States. That would provide motive for refusing to go public. But if that’s true, how long can the truth be suppressed? I imagine that sooner or later, even if Obama is elected for a second term, actual dissembling about his citizenship would come to light eventually. And that would not be good for Obama. Here’s something to consider. There’s a good chance that the history books will note the issue and document Obama’s determination not to publicize his birth certificate. Readers will not have the benefit of observing his charisma and judge his likeability. If the President isn’t eventually forthcoming, perhaps a majority of Americans a couple generations from now will be birthers. That would not be good for Obama, either. What President would wish to go down in history as very possibly the only “American President” who was never really a legitimate President? The only way for Obama to ensure that that never happens is for him to produce his birth certificate. Snopes.com also has written in defense of this perspective. See Wikipedia articles on conspiracy theories about the Obama birth certificate and about Article 2 of the U.S. Constitution. Donald Trump appears to be testing the water for a run at the presidency in 2012. Could this be why he has re-introduced the topic of Obama’s birth certificate into the national discussion? Chester Arthur, 21st President of the U.S., has gone down in history with doubts about his citizenship still lingering. Vice President Arthur succeeded President James Garfield after Garfield died of gunshot wounds caused by an assassin. Bill O’Reilly interviewed our president on Sunday morning for about fifteen minutes of live television. Bill (it’s all first-name basis these days) has been collecting reactions from “the regular folk” and from everyone else who will favor him with an evaluation. 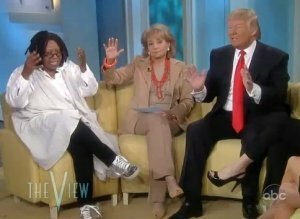 Some of his guests have been on his show to talk directly about his interview performance: Brit Hume, Bernie, and Charles Krauthammer. And notice how he interprets what the president said. He asked whether Obama agreed that he had moved toward the political center since the November election, when so many Democrats were turned out of Congress. Obama said he hasn’t moved. O’Reilly keeps saying that he (O’Reilly) believes the president “really thinks” he has not moved toward the center. I doubt that Bill O’Reilly knows better than the rest of us what the president believes. I can’t tell from the interview that O’Reilly is in a better position to know than we are. And from what the president said in the interview, I can’t say with confidence what the president believes—certainly not with O’Reilly-styled bravado. I feel more confident saying what the president wants us to believe. And he wants us to believe that he hasn’t moved politically. After all, that’s what he said. What he said is what he wants us to believe. Of course, as long as it’s unclear what Obama meant by what he said it will be to that extent unclear what we are supposed to believe. The politician’s specialty is to answer a direct question ambiguously, but to disguise its ambiguity so that it is confidently interpreted one way by one group of constituents and is confidently interpreted another way by another group of constituents. If you can get disagreeing constituents to believe they have the correct interpretation of your words and they happen to like what you say on that interpretation, then you have acted the political genius. The evidence of Obama’s political genius is that O’Reilly thinks he knows what the president believes based on what the president said. What Obama said is probably supposed to mean one thing to those of us who are troubled by his leftist political outlook, and something else to those of us who are cheered by his leftist political stance. (It may not mean anything to those of us who think he isn’t a leftist.) To the first cohort, it should mean that he has never been the insufferable leftist that many have feared. To the second cohort, it should mean that he is every bit the leftist that many have hoped, and that he will continue to resist insufferable conservatives. I can’t take seriously any interview where a politician makes it necessary for me to read between the lines in order to “know” what the politician believes or means. This is because one can’t really know what a politician means when what he says is ambiguous—and hence deniable. When the ambiguity is evident, then we should know that we don’t know, and we should know better than to think that we do know. But skillful ambiguity may fool us into thinking that we do know what we don’t know. So, did O-Reilly discharge his duty as a journalist and press for the kind of clarity needed for his interview to matter? That’s for you to decide. I’ve been watching coverage of the mess in Egypt and have not commented here until now. I’m stunned by what I’m hearing . . . and not hearing. TV commentator Rich Lowry spoke tonight as if the Obama administration had only two choices. He could support Hosni Mubarak, the evil dictator, and watch the Egyptian President shoot down the demonstrators in the streets. Or, he could support the “democratic demonstrators” in the streets of Cairo. Obama, he thinks, rightly chose to support the democratic demonstrators. Where does Lowry get the ridiculous idea that the protesters are “democratic”? Their demonstrations have hardly been peaceful. And who are the Muslim Brotherhood? They sound like barbarians, and the likely heirs to the evil Mubarak regime. John McCain said it well yesterday. Mubarak has been a friend to the United States for many years, and he has helped to keep some stability in the Middle East—which is otherwise hell-bent on the extermination of Israel. But Mubarak stayed too long and did not use his position to institute a democratic government in Egypt. After watching the mess on the streets every night from the comfort of my living room, I’d like to know what democratic measures anyone, Mubarak included, could have introduced. I can’t visualize these people stowing their molotov cocktails the day after tomorrow and going peacefully to the polls to elect a respectable government in a free election. The Egyptians are making a spectacle of themselves in front of the rest of the world. Their actions have galvanized dispirited citizens in countries elsewhere in the region. What exactly is their message, and why should we care what they want if all they can say is that Mubarak has to go? Mubarak says he would like to leave, but believes the country would descend into greater chaos if he just walked away right now. Maybe people should consider the possibility that he’s right. Here’s another possibility. Our president has been telling us, the American people, that he’s been talking tough to Mubarak on the phone. When our president announces this on television, then it doesn’t matter what he said on the phone. The world has heard Obama scold Mubarak and tell him what to do about the mess. So what’s Mubarak supposed to do in response? Is he supposed to let Obama dictate to him what he should do? What if Mubarak is as vainglorious as Obama? Does Obama really understand “the democratic process”? He seems to think that the process begins with a free election. This is simply naive. A “free election” isn’t an important step in a democratic process if that election results in a fascist government. And it looks like that’s the result we should expect. Dana Perino told Greta tonight, “Democracies take time.” Obama doesn’t know that? What’s really going on in Egypt? Everybody is guessing here, including our officials. They’ve made that pretty obvious. Shame on them for being so out of touch with world realities. And shame on us if we stand by and watch without criticism the naive, oddly paranoid and aggressive response of our government to a complex conflagration. We’ve ostracized a valuable ally. Israel is mystified by our response. Things aren’t getting better on the streets of Cairo. The Muslim Brotherhood lurks in the background. Obama chastens a proud dictator who no doubt has his own ideas about what he should do. Mubarak won’t budge (as of today). Western reporters are crying foul for the mistreatment they’re receiving in their efforts to scoop the story. I would like a clear and detailed statement from Mr. Obama that explains his view of our relationship with Egypt, and how it will improve if Mubarak walks away and the people participate in the kind of free election he has goaded them to demand.